Genius Car Ltd is a holding company based in London with ownership of various companies in the technological and innovation area, including Italian Covini Engineering. 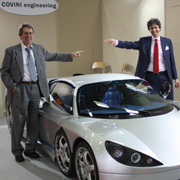 Covini Engineering has been developing for many years innovative automotive projects including the COVINI C3A as a luxury road car and the COVINI Speedster built for the sports car circuits. Both utilize the 3 axis and 6 wheel design. COVINI cars are "limited edition" cars with exclusive and personalised service and spec. Genius Car's head office is in London in 29 Harley Street, while the technical and production facilities are based near Piacenza where the prototype was created. 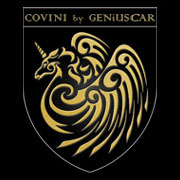 Genius Car is a company that develops and builds limited edition luxury cars and in particular the luxury car Covini. We also work with our clients to build high-end tailor made sport cars. The Covini C3A is unique in its consideration of the front wheels, which are of a comparable dimension to a 4 wheeled car. The C3A was built with better safety, outstanding braking and directional stability in mind. Because there are 4 front tyres, there is less chance of a loss of control if a front tyre deflates. There is a reduced risk of aquaplaning too, as the front axis set clears the road for the following axis set. In addition, having 6 wheels instead of 4 gives greater braking power with 100% more contact patch and braking components. The unique design produces more grip and less understeer than conventional designs. The increased surface area helps the suspension system provide a smoother ride, ironing out road bumps more efficiently. The C3A still remains the only 6 wheeled car on the market. Its exclusivity and unique characteristics ensure it appeals to the high end luxury market.